CENTEREACH (WABC) -- An officer with the New York State Department of Environmental Conservation rescued a deer that got its head caught in a light on Long Island Wednesday morning. 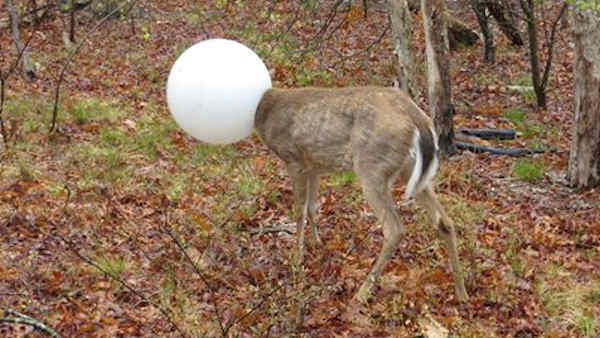 Officer Jeff Hull received a call around 9:45 a.m. reporting that a deer in Centereach had managed to get its head stuck inside a light globe and had been laying in the woods since the previous night. Upon arrival, Hull spotted the deer about 20 yards from the road in a housing development. He approached the deer, but on his first attempt, the wet globe slipped out of his hands and the deer ran into a nearby downed tree, causing it to fall. Hull then flung his coat over the globe, bear-hugging it with both arms as the deer kicked and struggled to break free. The animal managed to slip out of the globe and ran off into the woods.